Peel and finely slice the onion, fry gently in olive oil. Cut off the ends of the asparagus, peel them, drop them in boiling salted water, cook for 5 minutes after they have come back to the boil, drain, line them up the same way in a large pan and braise them slowly in olive oil for 20 minutes, turning halfway through cooking and seasoning with salt and pepper. Cut the asparagus in half lengthwise, add the cream, lemon juice and onion to the pan, season with salt and pepper and reduce over high heat for 5 minutes. 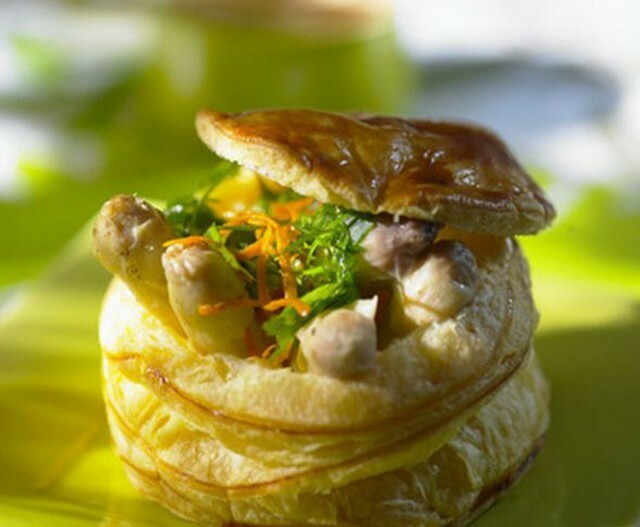 Cut 8 puff pastry discs 8 cm in diameter, brush with egg yolk, make incisions around the edge with the tip of a knife. Place the discs on a baking sheet (4 per sheet) covered with parchment paper, bake in preheated oven at 200°C (gas mark 6) for 10 to 15 minutes until the pastry is well-risen. Fill with the cream and asparagus mixture, sprinkle with orange zest and sprigs of chervil, serve hot.